A panel of experts from the EU is visiting Malaysia this week to get a firsthand look at the country’s palm oil industry. Key to the discussions will be the sustainability of Malaysian palm oil for the EU market, in particular for biofuels. Industry blogs have openly questioned whether this visit is a true fact finding mission or a token gesture. The Malaysian industry has long said that it is responsibly produced. That despite its global standing as the second largest producer of palm oil after Indonesia, the country has managed to maintain forest cover over half of its land area. Deforestation associated with palm oil is a sensitive issue for the Malaysian palm oil industry which is trying to distinguish itself as not merely “palm oil” but “Malaysian palm oil”. With alarm bells of palm oil expansions in Africa causing deforestation, the CEO of the Malaysian Palm Oil Council, Dr. Sundram Kalyana asked at a recent conference on sustainable palm oil, whether deforestation in Africa will taint Malaysian palm oil and what can be done to avoid that association. It remains to be seen whether the Malaysian palm oil industry can make a case for itself as responsibly produced but the bigger question to the EU is whether it can afford to dismiss what is the best solution for food and fuel. Since the European Commission’s decision on biofuels in June of 2018, the IPCC has issued a report that warns that there is a mere 12 years for a global effort to fight the ever growing ravages of climate change. "Climate change is here and we need to act now. Yes, the solution of using RJF comes with a higher price tag at the moment, but it provides long-term benefits and value to the environment. Can the price ever be too high when it comes to combating climate change?" The use of fossil fuels to power human activities has been identified as one of the biggest contributors to the current change in climate but the favor of rich nations towards cheap fossil fuel energy continues. This may well change in the coming years as the true environmental costs of fossil fuels establish themselves. In the meantime, these are some fast facts on the sustainability of Malaysian palm oil. Facts on Malaysian palm oil. 1. Second largest producer but top exporter. According to statistics from Indexmundi, Malaysia produced 21 million tons of palm oil in 2017 and exported close to 18 million tons of this. This heavy reliance on export markets makes it especially sensitive to market demands whether it be for price or sustainability. As reported by the Center for Promotion of Imports from Developing Countries, Malaysia has surpassed Indonesia as the biggest exporter to Europe as sustainability issues drive overall demand downwards. 2. National commitments to stop deforestation for palm oil. Malaysia is made up of thirteen semi-autonomous states that can make state level decisions on land use. Palm oil production levels between the states are markedly different. Sabah state which was one of the most productive states in Malaysia is now being overtaken by Sarawak state for production volume. On a federal level, the new Minsiter of Agriculture, Teresa Kok, announced this year that a cap on palm oil expansion has been placed in order to protect the remaining forests in Malaysia. The Malaysian Palm Oil Association (MPOA) has pledged their support to maintain the forested areas. The state government of Sabah has announced that any expansion of agricultural activities including palm oil, will only be on degraded lands. The state government of Sarawak has declared a moratorium on the expansion of industrial palm oil plantations except those that involve Native Customary Rights. 3. Demand will not drive deforestation in Malaysia. This is due to two simple facts. Firstly, Malaysia has excess production from its planted areas. Secondly, the industry overall is under productive. Even though the national average per hectare is close to 4 tons, on-going developments to intensify cultivation on planted areas and further increase yields by minimizing harvest wastage will increase production levels without the need for expanding planted areas. 4. Palm oil certification as national policy. 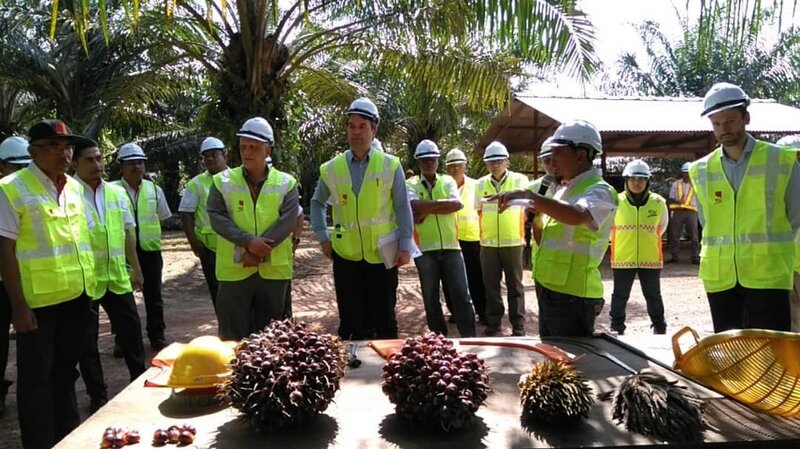 To assure its buyers of the sustainability of Malaysian palm oil, the government has set in place a certification system under the Malaysian Sustainable Palm Oil (MSPO) initiative which will serve to document all of its palm oil productions. The credibility of the scheme may well be contested by environmental groups but as a national policy that addresses the need for sustainable development, its acceptance by other governments maybe seen in the joint Swiss-Malaysia committee to address palm oil related issues. All of this goes to show that the use of palm oil from Malaysia without the fear of continued deforestation is possible. The question now has to be whether the European countries are serious about fighting climate change. Current indications are that the EU will continue to favor fossil fuels for transport and energy despite the science behind their climate changing consequences. Bioenergy which has the potential to reduce transport and energy emissions continues to take a back seat in public policy as fear mongering by interest groups continue. The bioenergy sector has to do a better job of validating its potential to reduce emissions very quickly. The Malaysian palm oil industry can play its part by correcting some of the misinformation by showing the visitors from the EU that it is sustainably produced.